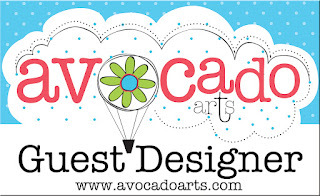 I'm Guest Designing for Avocado Arts this month! Yay! They sent me their FAB September stamp set - Grateful Season - to play with. And it's a cutie. :) Check it out in their shop here. For my card, I used the adorable worm stamp and a couple of sentiment stamps. I added some stitching, then pierced holes by running the card through my sewing machine unthreaded. Simple, yet so effective. Love it! Hee! That glossy accents worm is a cutie!